For the past 4 months I’ve had the pleasure of traveling with an amazing companion. I met my boyfriend, Dennis, in Bangkok (referenced in my previous post!) back in November and since then, the two of us have seen and done some pretty incredible things together. There is not a single worldly possession that I would trade for the memories we have made. Unfortunately he flew home to The Netherlands a few days ago, so I’ve been having to readjust to being alone. If there’s one thing I know, amid all the general anxieties that plague my brain, it’s that I’ll be missing him very much. So far I’ve spent 1.5 months in Thailand, 1 month in Cambodia, 1 month in Laos and 1.5 months in Nepal. I had mixed feelings about Cambodia… I did my first volunteer job there, finally got to see Angkor Wat and I learned about the genocide committed by Pol Pot and the Khmer Rouge. All these things were huge learning experiences. But I also got sick 4 times in just one month, meaning I spent half my time in bed feeling miserable (my immune system was seriously compromised). Because of this, and because I’m still in this mindset of recovery, I’m not eager to go back. 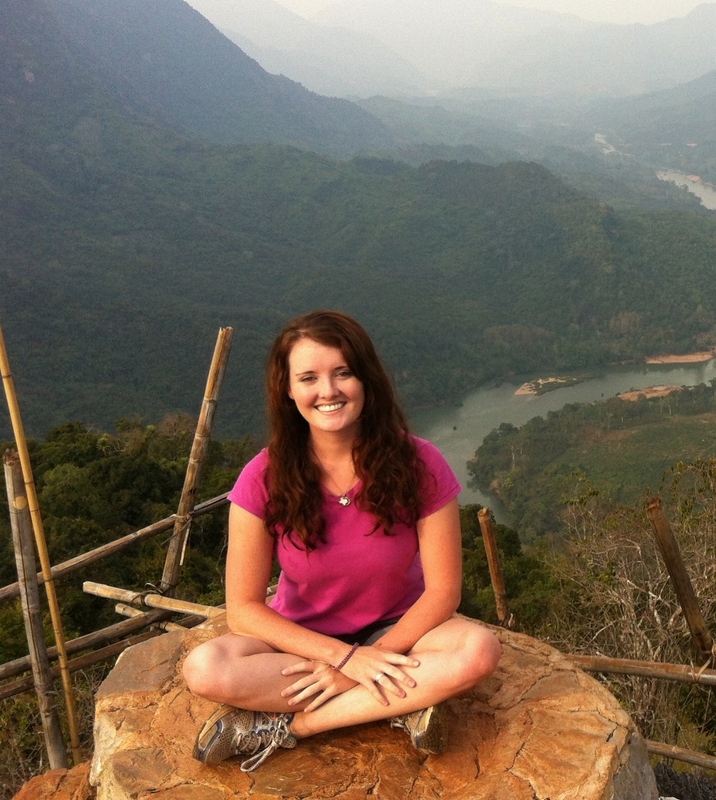 Laos was different… it was absolutely beautiful and extremely laid back. Getting around was a bit more difficult (and expensive) but still manageable. Dennis and I traveled all the way from the south of the country to the north. We learned about the UXO (unexploded ordinances) situation which left me feeling guilty as an American and wanting to do more. We spent a lot of time exploring the nature, which didn’t hold back one bit in its allure. When it came time to leave, I was actually quite sad. Maybe one day I’ll make it back there. But then came Nepal… and I can say without a doubt that Nepal takes the cake so far. I love it so much here that I extended my visa an extra 2 months so that I can learn more about the country and the people. I have always found it more worthwhile to familiarize myself with places that are most different from the environment I was raised in, making Nepal the perfect country for me to stop and smell the flowers. It’s a cocktail of some the best and worst things the world has to offer, which is what makes it so interesting. It’s famed for its natural Himalayan beauty and intoxicating culture, and there’s no doubt that it has exceedingly large amounts of both. It also has some of the friendliest people I’ve ever met. The downside is that there is a lot of poverty, corruption, unequal rights for women, political turmoil and poor infrastructure. Things are improving, but there’s a long way to go. These are some of the aspects which I want to come to know and understand better, the aspects which are too often overlooked by foreign visitors who are captivated by the country’s beauty (myself included). This is why I am staying here longer than I’ve stayed anywhere else. I really want to know this place as best as I can in the short amount of time that I’ve got. Ponies grazing against the rhododendrons and Mt. Dhaulagiri backdrop. I’ve spent the first half of my stay doing the things that bring this country fame: trekking in the mountains, trekking in Chitwan jungle, visiting Lumbini (birthplace of the Buddha), exploring Pokhara and the Kathmandu valley, and making a trip to the Manakamana Temple (Hindu pilgrimage site). Dennis and I also got to celebrate the Holi festival of colors in March. All these experiences have been truly remarkable. I don’t think I will ever find another country as beautiful as this one. In addition, I’ve met some extremely kind and hospitable people, one of which has arranged for me to stay with his family while I volunteer at a local school in Narayangadh. It’s a wonderful city situated near the southern Nepali border with India and therefore a prime import/trading route, bustling with energy. It also has beautiful sunsets. I feel very lucky to have met such a generous and welcoming family willing to host me, and I’m so excited to dip my feet into teaching – something I’ve wanted to do since the start of my trip. If it all works out, this is where I’ll spend the rest of my time here. I’ll try to keep up with my blog better now that I have a little more time on my hands. There is no such thing as 24/7 electricity here. The entire country is run by hydropower and there’s just not enough to go around (except perhaps during rainy season). For the duration of my stay I’ve gotten between 3-12 hours of electricity each day, maybe more if my hotel has a backup generator. The times that you get power change from day to day and place to place, so I find myself lucky to get it during prime waking hours. But at least there is a schedule that is followed closely enough for me to plan accordingly. By some strange Godly occurrence I’ve had almost 80 consecutive hours of electricity over the past 4 days, which I’m still completely puzzled by. It must have to do with the New Year celebrations nearby. I feel spoiled. Strikes… Nobody told me about them. Apparently the country is always on strike and it’s been this way for a while now. When Nepal is on strike it means all public and private transportation is forbidden and all restaurants and shops have to close down. I’ve only been caught up in one, and luckily I was far enough from the main roads to really be affected (some shops could get away with staying open, for example). Dennis and I had to delay our transport until the evening, when the vehicle ban got lifted until the next morning. It was no problem for us because we were only going one town over. But it can be really bad for others, particularly local businesses and tourists on a tight schedule. Sometimes strikes can last multiple days, sometimes only one. Sometimes there’s warning, sometimes there’s none. Sometimes they get violent, sometimes they don’t. There are different types: general, national, regional, fuel, student, etc. but from what I understand, the bulk of them have to do with the drafting of the national constitution, which Nepal has been trying to do for more than 5 years now. But the 20 or so political parties can’t agree on anything, leaving the people rightfully frustrated and impatient. Speaking of politics… if you like Game of Thrones, read about the Nepalese royal massacre of 2001. Better yet, read about all the politics of Nepal since its inception. I promise you’ll be well entertained. Public transportation is extremely crammed, uncomfortable, confusing and bumpy. I never realized just how many people could be stuffed into a bus until coming here. People are already falling all over each other and you think to yourself, “Surely they won’t load more people in at this stop.” And then they do. And I really don’t understand how. There are a few times when I’ve seen people hanging on the sides of the vans because there’s no more space inside. The upside to this is that it’s not always that crammed and I can get to wherever I need to go VERY CHEAPLY. So I don’t mind most of the time. In fact, it’s pretty awesome. There are more luxurious buses for tourists as well, but it’s less interesting and more expensive that way. I like saving money too much to bother with them (Mom, you would be proud). This is a huge welcome after having to deal with the comparatively more expensive transportation system in Cambodia and Laos. In general, Nepal is the cheapest place I’ve ever been. No joke. It’s really, really inexpensive to live here. In fact, it is ranked the second cheapest country in the world just after its grand ole neighbor, India. It took me a little while to learn the true prices of things, but now that I know, I can avoid being tricked as often. If it seems too good to be true that you can eat a chicken fried steak and french fries in a shanky shack restaurant on the side of a mountain, it probably is. Just because it’s on the menu doesn’t mean you can order it. Nepal uses a different calendar than the US making the year 2072 here (the new year begins mid-April). I’ll try to add more to this list with each post. Obviously there are many positives and negatives of Nepal but it makes for an endlessly fascinating and challenging experience. Besides, I find that the positives far outweigh the negatives. I wish more people would travel here and I will probably end up trying to recruit new visitors after I leave! I’m really looking forward to learning more and sharing my experiences with whoever reads this.